2019 marks the 40th anniversary of one of the industry’s most respected and best loved suppliers – Business Micros. The company is planning a series of celebrations to mark the event, many of which will be centred on its stand at the FIT Show in May. Established in Scotland by Des Sharratt and Alistair Fyall way back in 1979, Business Micros was a true pioneer in the introduction of software to this industry and still very much sets the agenda today. It started out supplying software to the aluminium window and door sector, but quickly advanced into timber and PVC-U during the 1980s, growing rapidly to become the industry’s undisputed number one. Current Managing Director Graeme Bailey and Technical Director Jim Cronie joined Des in 1990 and together they helped shape Business Micros into the dynamic, innovative organisation it has become, building a reputation along the way for looking after customers and staff and for always delivering on promises. 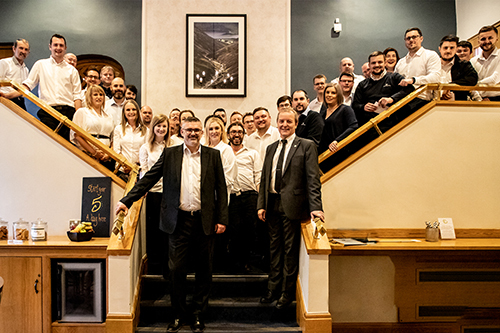 When Graeme and Jim arrived, there were around 250 customers and just a handful of staff. Now, the number of customers stands at more than 2000 and, within its two distinct divisions – Business Micros and BM Aluminium – the company employs close to 50 people.